In Texas, guacamole is omnipresent. There are as many recipes as there are bragging-prone hermanas and hermanos. I myself not being one to brag,, Ahem.., my recipe is based on 3 simple rules. 1. Purchase them Green and Hard. Rodolfo Fernandez is the top Avocado expert in our region. For many years he provided the best-tasting avocados to Mexican restaurants throughout San Antonio. I follow his advice. 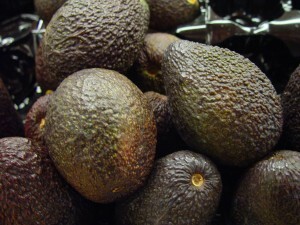 At the produce section, purchase Mexican or Haas aguacates while they are still green and very firm. Store them in a plastic or paper bag and wait two days, maybe three, at which time they’ll begin to ripen and soften. It is then that they are at their peak of flavor. There is no substitute for this direct, natural taste. You’ll say, wow. The fresh, full flavor of the avocado takes nicely to complementary seasonings and accompaniments but be judicious. At all costs do not mask the texture or flavor of the aguacate. 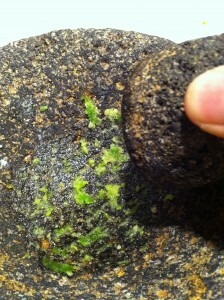 In the recipe below I explain how the foundational flavor is developed in a molcajete. The name appears in early writings, MesoAmerican hieroglyphs, documenting that the Avocado is native to Puebla, Mexico. Here is an original glyph of anavocado tree linked to the place where the tree originates, the town of “Ahuacatlán.” The earliest remains of avocado consumption, 8,000-7,000 BCE, have been found in a cave in what is currently Coxcatlán in the state of Puebla, Mexico. From there the little lush fruit travelled and developed. There are three botanical types of avocados, Mexican, Guatemalan and Antillean. This map (2) lists where the origins of each of the types may have developed. Notice that the Mexican avocado is within the current Texas Mexican area. So enjoy this recipe knowing, again, that for millenia our land has nurtured us with delicious fruits and wonderful cooks. Hmmmmm! 1. 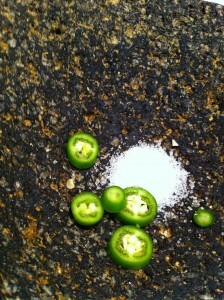 Using a molcajete, make a fine paste of the onion, chile, cilantro and salt. Here is where I mentioned that you can develop the flavor direction that your guacamole will take. 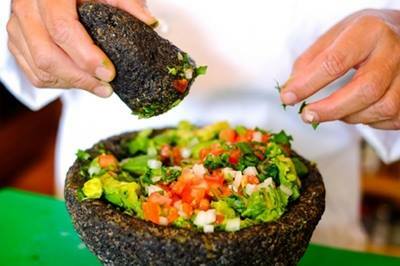 You may add other seasonings to the molcajete, but keep in mind that you are following many years of tradition. Make sure your variations are culturally relevant, enticing to the palette, and not just vacuously trendy. Vacuously trendy will include broccoli and green peas. 2. Dice the avocado and add to the molcajete, scraping and folding to make sure the avocado is covered with the seasonings. 3. Add the remaining tomato, cilantro and onion. 4. Serve immediately with freshly made corn tortillas, or with crisped tortilla chips. (1) HISTORIA DEL AGUACATE EN MÉXICO, Salvador Sánchez Colín, Pedro Mijares Oviedo, Luis López-López, Alejandro F. Barrientos-Priego. (2) HISTORIA DEL AGUACATE EN MÉXICO, Salvador Sánchez Colín, Pedro Mijares Oviedo, Luis López-López, Alejandro F. Barrientos-Priego. I love how you provide a historical account of the recipe. It is very interesting and educational at the same time. An excellent, well-written recipe producing a flavorful, authentic guacamole. Highly recommended!